(2-LP set) A thrilling debut for one of the most original British bands of the '90s. A romantic and elegant chamber pop masterpiece that mixes indie rock forms, the maverick pop song craft of a Lee Hazlewood and/or Van Dyke Parks, and the dark charm and hip romanticism of Ian Curtis, Scott Walker, and Leonard Cohen. 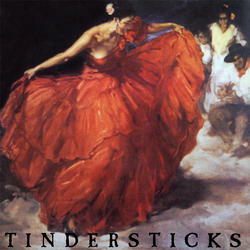 While in the UK it was named album of the year (1993) by Melody Maker, in the USA Rolling Stone wrote: "the 1st Tindersticks album draws inspiration from the playful narrative style of producer Lee Hazlewood, the Cinemascope orchestrations of John Barry and the twilight-zone claustrophobia of Nick Cave and the Bad Seeds." 180 gram vinyl in a gatefold sleeve. Our stock on this item is limited to the quantity we have on hand (Stock=7). The quantity we can supply is a maximum of this amount (7). Orders will be filled in order received until stock runs out.